In my lab I’m using a Proliant DL380 G5 filled with disk as a storage server, running some VSA on top of the volume I created and formatted with a vmfs filesystem. First, I identified the controller. Remember is in slot 3, this will be needed in the next commands. which added disk 7 into the array. This process took just over 24 hours. which added disk 8 into the array. This process also took just over 24 hours. 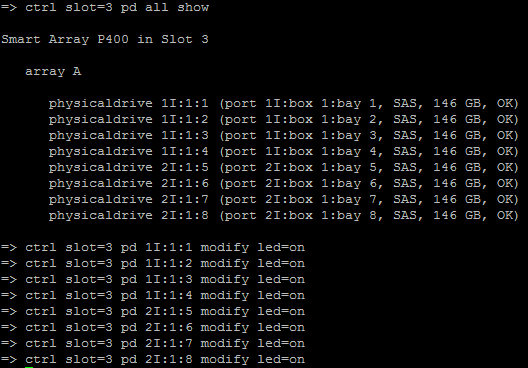 showed that both drives were added to the array. 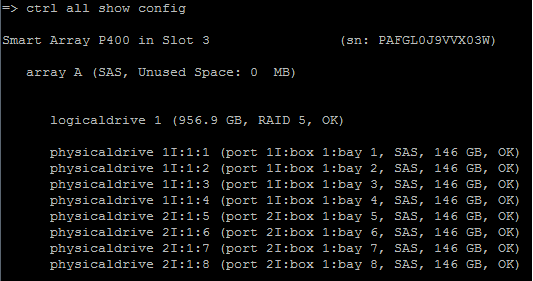 However the space as reported in the HP System Manager was still 1.4Tb (same as before). Once this had completed (it took a couple of seconds), all that needed to happen was a reboot for Windows to recognise the new space. I then connected to the Hyper-V host via Computer Management and extended the available space with Disk Management.